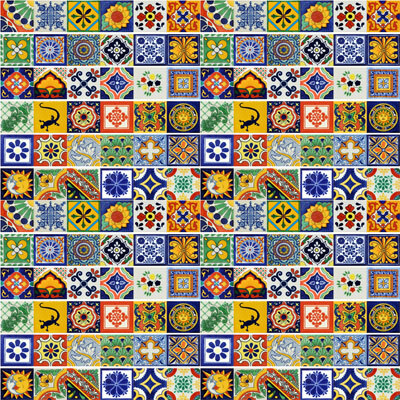 In this set of mexican talavera tiles you will find great variety of colorful designs, these mexican tiles are for decorative use, these ceramic tiles are handmade and handpainted. Ideal to decorate your place with the magic and the color of the Mexican tradition. 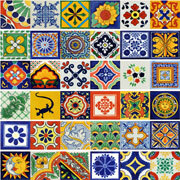 You can choose between a mixed set or customized set or even a set of only one pattern./n This set of mexican tiles contains a big variety of colors and designs to make your home decor unique. You will find in our facebook and pinterest a lot of ideas to decorate your house, garden or any place using our mexican tiles. 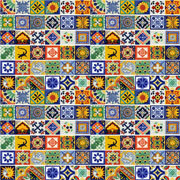 In Mexican Tiles For Sale.com we are glad to assit you in our phone number (424)781-3473 or in our email mexicantilesforsale@outlook.com.